Betty's Cook Nook | Celebrating Mom. Celebrating Mom's Food. If you’re reading this, you have one, too. My Mom? She was more amazing than she’d admit; she was an awesome soul, a talented artist… and a fabulous cook. “Betty” (or “Betty Jo,” as she was known by school-time friends), was born in an era when the kitchen was the true heart of the home. My family eating dinner together every evening was a cherished ritual that was as predictable as the sun and the moon. While dinnertime yielded simple pleasures through creating, sharing and bonding, the regularity of the home-cooked family dinner seems to have diminished in the crazy fast-paced days of late. In an untimely, but awesome chain of events stemming from childhood friends re-connecting via Facebook, a new chapter of life has been born. When speaking with my Mom’s best friend “Bristol” in 2011, I learned *she still had* Mom’s cookbook and was happy to return it to me. Within a week, the cookbook traveled from Bristol’s kitchen in San Antonio to my kitchen in Dallas, arriving May 9, 2011. My goal is to archive my Mom’s favorite food recipes here as my way of honoring my family and documenting the past for future foodies. My hope is that you experience Betty’s recipes as a way to celebrate the art of food making and eating… and that you share your comments and food-making suggestions here at Betty’s Cook Nook. Reliving the delicious foods that nourished our family during my wonder years is something that has brought new perspective to life… certainly touching the heart and belly in the most magnificent of ways. Cheers to this great new adventure! Start diving into Mom’s digital cookbook by searching above, at right… by recipe categories or by specific ingredients. Follow your finger… and your belly! And above all else, have fun! This is so interesting and emotional at the same time to read about the life of a grandmother I never met. Thank you for creating this.. you are an amazing uncle! Thanks, Kim! I created this site for you and the family. I’m sad you never met my mom, but trust me when I say that any of the “good” in us boys of three came from her and dad. I hope you always remember this site. And I hope I can steadily keep it filling-up each week with recipes for awesome meals so we never go hungry again! Life is a wonderful adventure and tasty food in your belly makes it all the better. I’ll make you a bowl, too, when you’re ready. Loving it, Pac Man! Of course, to be true to the era and locale, you really need a tag for Pimento Cheese. What a great looking group of fellas!! I love the picture of your mom – sure miss my mama every day of my life. Thanks for stopping by Deep South Dish and taking the time to comment today. I really hope the garlic cheese substitute works out for you – hope you’ll let me know either way. I look forward to checking out your mom’s recipes! What an awesome tribute to your mom, PK. I love this! Although you didn’t meet mom in our younger years, we’ve all connected through our happy bellies’ joy of food. Long live the recipes from our younger days! Patrick – nice work in progress! A cyber-space tribute to Mom and Dad. I suggest labeling the photo – that way we won’t keep folks guessing. Make sure the link finds its way to Miss Joyce and Mrs Fagan – they may have receipes to add to the collection. I’ll call you for their phone number / email address ~ I can’t find them on Facebook. Go figure. I ABSOLUTELY loved reading about your Mom and family — bringing back memories of the traditional recipes made with such love by our Mothers. It’s a lost art. You gave me great Christmas recipes which I will share with family this year. My late Mom’s wonderful, made-from-scratch Chocolate Cream Pie and Pumpkin Pie are requested each holiday season by my brothers, neices and nephews. And I deliver!! Paula, I have no doubt that you deliver in spades! Thanks for your comment here on my mom’s blog. I will keep adding her favorite foods here and hope you may find a few favorites of your own (Ummm, the Avocado Soup, California Potato Salad and Caramel Ribbon Brownies make my tummy “Do The Hustle”). Thanks for seeing my Facebook post and writing to me; you keep my fire going! Patrick, I was lucky enough to know your mom, but not long enough to be invited to dinner. Bummer. Rather than try these myself (good luck), I want something prepared by you. That gives a clue that we’re long overdue for a visit, and it will include one of these recipes some of these days. Keep the thought! Your mom must be so proud of you for many reasons, and this wonderful tribute adds another one. You done good! Thanks for finding mom’s blog and reaching out! Let me know what recipe(s) you want made by “Chef Me” and I promise I’ll drive to Canyon Lake this year to make them for you. Scout’s Honor*! Actually, I was an “Indian Guide,” but you know what I mean. In the meantime, you better make sure that the pinball machine is revved, fully-functioning and ready to go… and that your “flipper-action” is in tip-top shape! I may be older, but I’m still spirited… and that’s half the battle! (the other half of the battle is functioning index fingers. I have those, too). * PS ~ Can I bring my Labs? Thank you for sharing with us. There are so many delicious looking recipes and I am going to pick one out for Sunday dinner tomorrow. I am touched by this loving tribute to your mom. Moms truly are special! Thanks, Julie! You’re the best. Our top favorites are the California Potato Salad, The Beef Tamale Pie and the San Diego Steak. You can also “wash” any of these down with my own rosemary smashed potatoes (we had these on St. Paddy’s Day). Enjoy the food… and thanks again for the Pot O’ Gold recipe. This is a new favorite finger food of mine! Thanks for finding Bettys Cook Nook and for writing. I see you already found how to follow us (up in the very top of the window) so “whoo hoo!” I have some more recipes coming soon – green rice and sangria. I love the internet. Today I was looking for an old picture of the balloon man from Shakey’s pizza. The search brought me to your picture first. I was quickly drawn into your Mom’s tribute and have spent forever going through each page. I love EVERYTHING about this! The stories, the pictures and the recipes, they are all amazing. You are forever bookmarked! By the way, this truly is a very small world we live in. 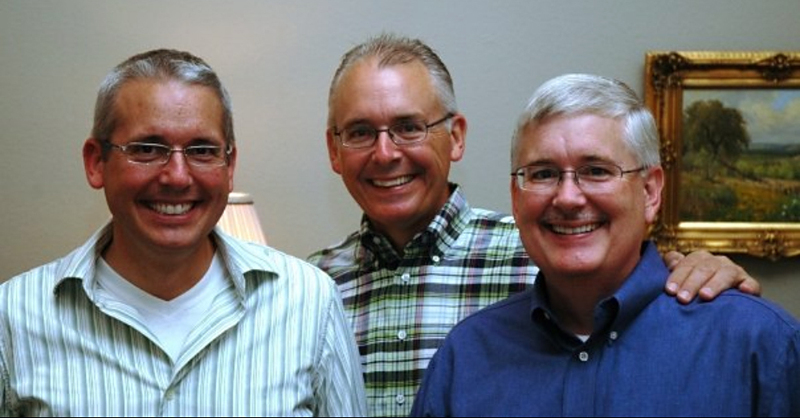 I am your neighbor to the north in McKinney, Texas! Thank you for sharing. Thanks so much for your kind email – it really made my day! I’m so happy to receive your note that I’m chompin’ to get back in the kitchen for another recipe adventure. 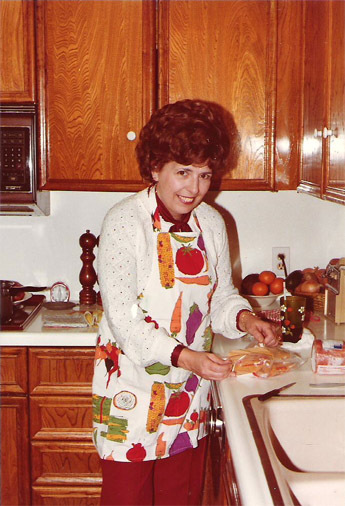 I started BettysCookNook.com mainly for my nieces and nephew to learn more about my Mom (a grandmother most of them never met) and I’m happy to share my personal stories with anyone who wants to learn more about food from the good ole days when I was growing up. I lived in Dallas for 22 years and recently moved to Austin so we are still neighborhood Texans united through the joy of food. :) Enjoy the recipes! Make sure and check out the California Potato Salad – it’s probably my most favorite and all my friends ask for it whenever there’s a cookout. Perfect for summertime.